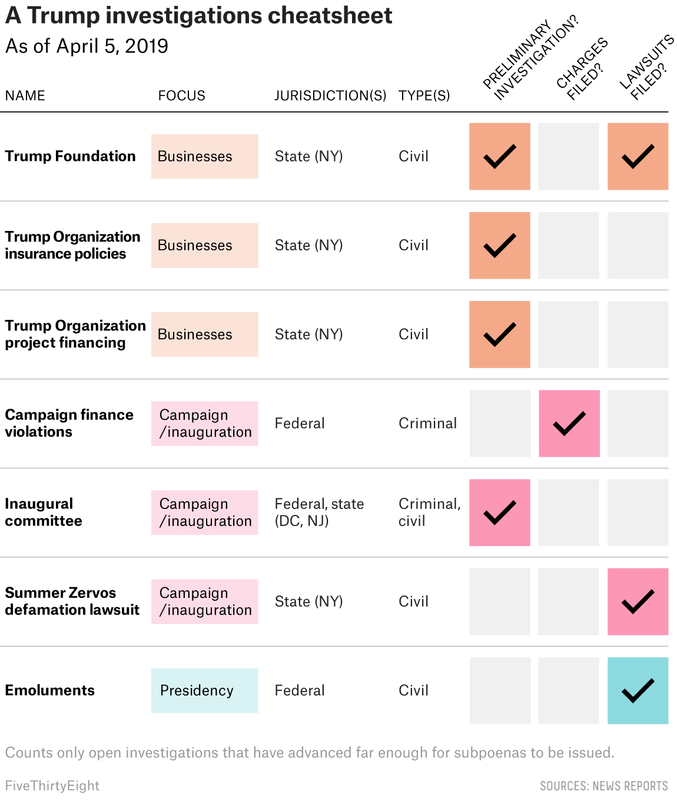 This is the Trump Docket, where we track some of the most important legal cases of the Trump presidency and how their results could shape presidential power. Questions, comments or thoughts about cases to cover? Email us here. Special counsel Robert Mueller’s investigation into Russian interference in the 2016 ended last month with no new charges. But the political fight to make Mueller’s full report public is still unfolding, and the president’s legal woes aren’t over either. If anything, the Russia probe overshadowed a number of other legal cases and investigations that are also risky for President Trump — including probes and lawsuits that involve his businesses, his campaign and inaugural preparations, and his presidency. Now these legal battles are in various stages of progress, including preliminary investigations that haven’t yet resulted in lawsuits or charges, plus several civil lawsuits and two criminal probes, one which has already resulted in a guilty plea by former Trump lawyer Michael Cohen. The cases and investigations span several states and federal prosecutors’ offices, and include a probe of hush money payments made in 2016 to two women who allegedly had affairs with Trump; a recently launched inquiry into the financing of several Trump Organization projects; and several investigations of the Trump inaugural committee’s finances. Below is a quick guide to 7 of the most prominent investigations and cases, with details about whether they’re criminal or civil and what major actions have been taken so far. And while several are still in early stages, the sheer volume of investigations and lawsuits indicate the president could have significant legal vulnerabilities. “We don’t know what they’ll amount to yet, but these investigations shouldn’t be dismissed as frivolous — if federal prosecutors have opened an investigation, that means there are serious red flags,” said Berit Berger, a former federal prosecutor and the executive director of Columbia Law School’s Center for the Advancement of Public Integrity. And even if Trump is shielded from criminal liability while he’s in the White House thanks to a long-standing Department of Justice policy that protects a sitting president from being indicted, the investigations related to his businesses, in particular, could do serious long-term financial damage. Early in Mueller’s investigation, Trump warned that digging into his business dealings would cross a “red line.” But that hasn’t stopped investigators in New York from launching investigations into Trump’s family business, the Trump Organization, and his private charity. These investigations aren’t criminal so far (although civil authorities can refer any criminal activity they discover to state prosecutors), which means they don’t carry the possibility of a prison sentence, but lawsuits could still force the president to hand over financial documents about his businesses or pay significant fines. A lawsuit filed against the Trump Foundation is one example of this threat. In June 2018, after a lengthy investigation, the New York attorney general filed a suit alleging that the Trump family illegally used the charity’s money for their own personal and political benefit. Because of the lawsuit, the foundation agreed to dissolve under court supervision last December, but the case is still ongoing, with the state seeking millions of dollars in fines and restitution. And criminal charges could still emerge as the result of a separate investigation where New York state tax investigators are reportedly probing the foundation to see if tax laws were violated. Now, New York state authorities are also investigating the Trump Organization’s financial dealings after Cohen testified before Congress that Trump had inflated his assets in financial statements to banks and insurance companies. New York state regulators recently issued a subpoena for records from Aon, the Trump Organization’s insurance broker, and the New York attorney general’s office also subpoenaed Deutsche Bank and Investors Bank for records related to several Trump Organization projects financed by loans from the banks. But these investigations are still in their early stages, and it could be months before we know more — after all, the Trump Foundation was under investigation for more than a year before New York filed its lawsuit. Additionally, any legal action that comes from these investigations could be stalled while Trump is in office. Trump’s lawyers have argued that a sitting president can’t be sued in state court for unofficial conduct, but so far New York state judges have disagreed. And even if Trump ultimately prevails on this point, his children and business wouldn’t have similar protections, which means he would still be vulnerable financially. One investigation has directly implicated the president in a crime — but his actual legal risk may not be very high. Even though Trump was effectively named an unindicted co-conspirator when Cohen was sentenced last December for two campaign finance violations related to payments to women who allegedly had affairs with Trump, most legal experts agree that an indictment from federal prosecutors is unlikely while Trump is in office. Lisa Kern Griffin, a former federal prosecutor and a law professor at Duke University, also noted that the statute of limitations for this campaign finance violation is five years — which means that if Trump is re-elected in 2020, he could avoid being charged altogether, even if prosecutors think they have sufficient evidence. Meanwhile, a campaign-related lawsuit that has largely flown under the radar could turn out to be a fairly significant threat. Summer Zervos, a former “Apprentice” candidate, spoke out publicly about Trump during the 2016 campaign, saying he had made unwanted sexual advances in 2007. She then sued him for defamation in New York state court after he called her a liar. Trump’s lawyers are fighting the lawsuit, but if they’re unsuccessful, he will likely have to give a deposition as part of the evidence-gathering process. This is a risky prospect regardless of how the lawsuit turns out, since former President Bill Clinton was ultimately impeached in part because of false statements he gave during a deposition for a sexual harassment lawsuit from Paula Jones, who accused Clinton of propositioning and exposing himself to her in 1991, while he was still governor of Arkansas. Then there’s the Trump inaugural committee, which federal and state prosecutors and officials are investigating for potential illegal foreign contributions and misspent funds. This might turn out to be more of a problem for the people involved with the committee than for Trump himself. But Ciara Torres-Spelliscy, a law professor at Stetson University, said that Trump could still be implicated through his business if his Washington, D.C., hotel, which received more than $1.5 million from the inaugural committee, was found to be inflating its rates. One of the biggest remaining legal wild cards for Trump is whether the lawsuits alleging that he’s violating two obscure anti-corruption clauses of the Constitution will be allowed to go forward. As I wrote last month, one of these cases — which revolves around whether Trump is infringing on the Constitution’s “emoluments” clauses by accepting payments from foreign and state diplomats through his business — may enable challengers to obtain detailed financial information about Trump’s Washington, D.C., hotel if the case moves ahead. The decision was appealed to the 4th U.S. Circuit Court of Appeals, where the judges appeared sympathetic to Trump’s lawyers’ arguments, and the challengers’ subpoenas have been put on hold while they deliberate. Legal experts told me the case could easily end up at the Supreme Court, but it’s hard to predict how the justices would rule because the important legal questions in the case haven’t really been answered before. Whether Trump is re-elected could be important here, too. If the lawsuit does go before the Supreme Court, it might not end up being decided until 2021 — after the winner of the 2020 election will have been inaugurated — meaning the outcome could be irrelevant if Trump is not re-elected. Trump’s legal troubles are not over, but the end of the Mueller probe may mean that the nature of the investigations against him are changing. The potential lawsuits and charges Trump now faces mostly center around his business practices, a less dramatic and politically sensational area than possible coordination with the Russian government. This means some of these inquiries may not resonate as much with voters. Some of these probes also may not be taken as seriously by the public because the investigations could be perceived as being politically motivated, which is a risk House Democrats also face with the slew of investigations they have launched into the president’s affairs. Both the Trump Foundation lawsuit and the investigation into the president’s financial dealings with banks are led by the New York attorney general, who has been openly critical of Trump. So the political ramifications of the remaining investigations and cases may not pose as significant a risk to Trump as Mueller’s probe did. But they could still inflict fairly significant personal damage for Trump — particularly if the New York-based investigations into his business dealings evolve into a full-blown case. The 2nd U.S. Circuit Court of Appeals heard oral arguments over whether Trump can block other Twitter users from his personal account without violating the First Amendment. Last year, a lower court judge ruled that it was unconstitutional for him to do so. She reasoned that because Trump uses Twitter for official presidential purposes, parts of his account, including the interactive space showing the replies to his account, constitute a “public forum” and that users are protected by the First Amendment against viewpoint discrimination by the government. The appeals court judges appeared skeptical of Trump’s argument — that he can essentially send tweets in his official capacity as the president but block users as a private individual. One judge noted that Trump was being represented by government lawyers, not private attorneys. “You are here because he’s not a private individual,” he said to one of the Justice Department attorneys. A panel of judges on the U.S. Court of International Trade rejected a challenge to Trump’s steel tariffs from a group of steel importers, who had argued that the law used by the president to impose the tariffs for national security reasons is unconstitutional. The steel importers are appealing the decision.